With the full line-up of international teams set for next summer’s World Cup in Russia, attention now turns to all the gear set to be used during the tournie. We are talking jerseys, boots and of course the official game or match ball. That belongs to adidas and the Telstar18 that was recently revealed. Given their recent history with World Cup balls (Jabulani 👎, Brazuca 👍) there is always going to be extra intrigue with what adidas has on offer on the largest showcase event. So what exactly has the once in every four ball got on offer for those that want one? Here is what you need to know! 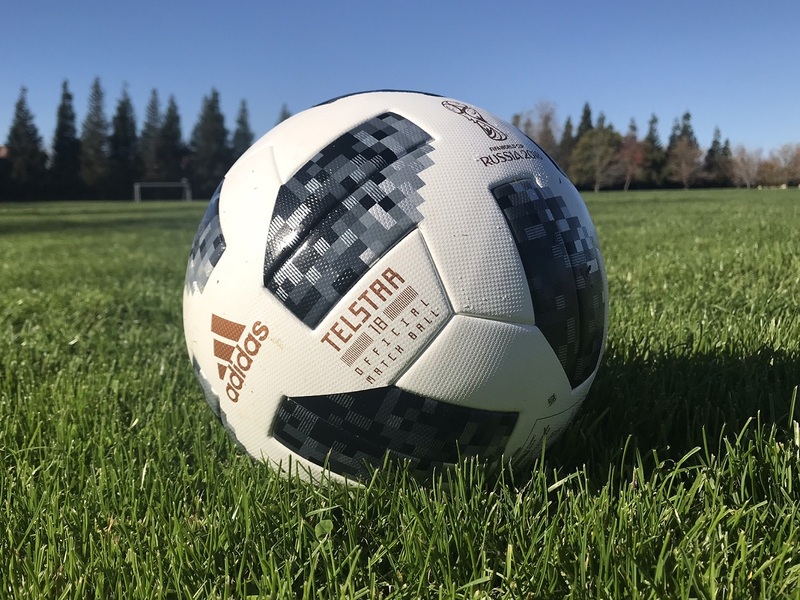 Find the current line-up of Telstar18 balls available at soccer.com. 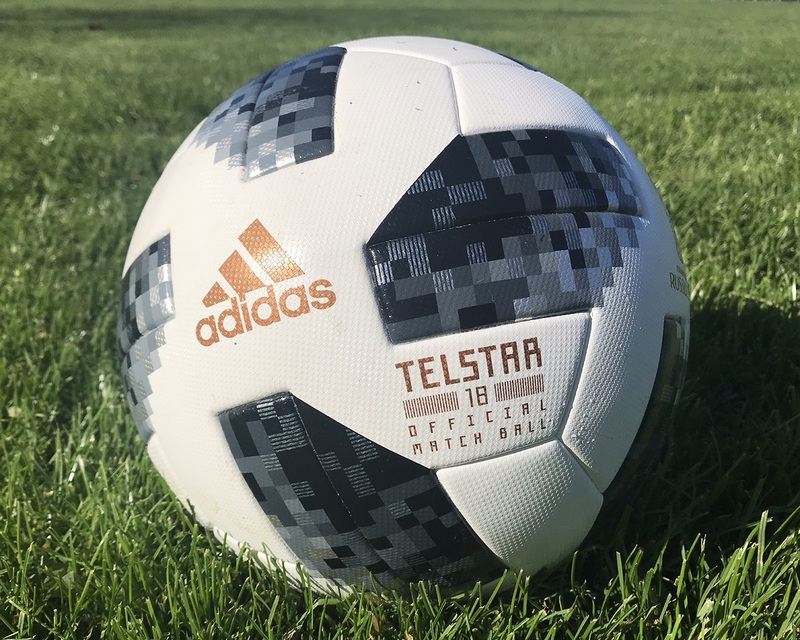 The new adidas Telstar 18 is a re-imagining of the first adidas FIFA World Cup match ball, the iconic Telstar that was used at the 1970 tournament in Mexico. The name of the original came from its position as the ‘star of television’. it was decorated with black panels, the pattern was designed to stand out on black and white televisions, and changed soccer design forever. On the 2018 edition, a brand new 6 panel design featuring a metallic print and texture graphic effect is used. It is like a modern day pexilation graphic that incorporates different grey scale colors. Unlike previous adidas World Cup balls, this version is a lot more monotone. There are no wild rainbow colors or enhanced visual effects. From use in games, the addition of a grey scale on a primary white base proves effective enough. No one complained about not being able to see it or reported visual issues. In fact, there is something very refreshing about a more neutral colorway that simply contrasts between the simple colors of black and white. There are also plenty of graphics across the ball that ensure you know exactly what you have. Gold is the color that adidas employ but during play you really don’t see it. What Else Is Unique About It? This is a ball that is engineered to provide top level performance and durability both in the stadium and on the street. The ball has a brand new carcass that retains the best of the Brazuca, while building in new technology to maximize performance. 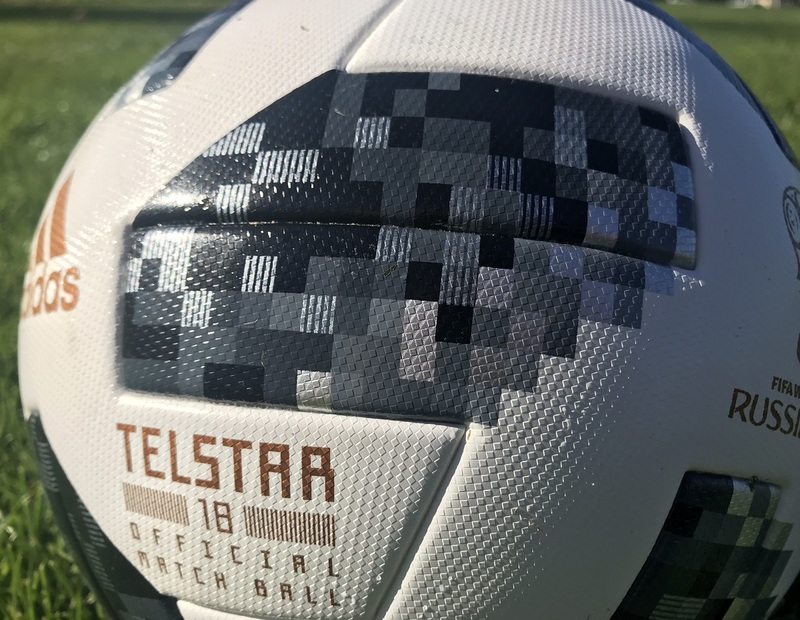 Sustainability has been a key focus of the Telstar 18, with elements including re-cycled backing material and packaging. This is where adidas take the Telstar18 to an entirely new level. 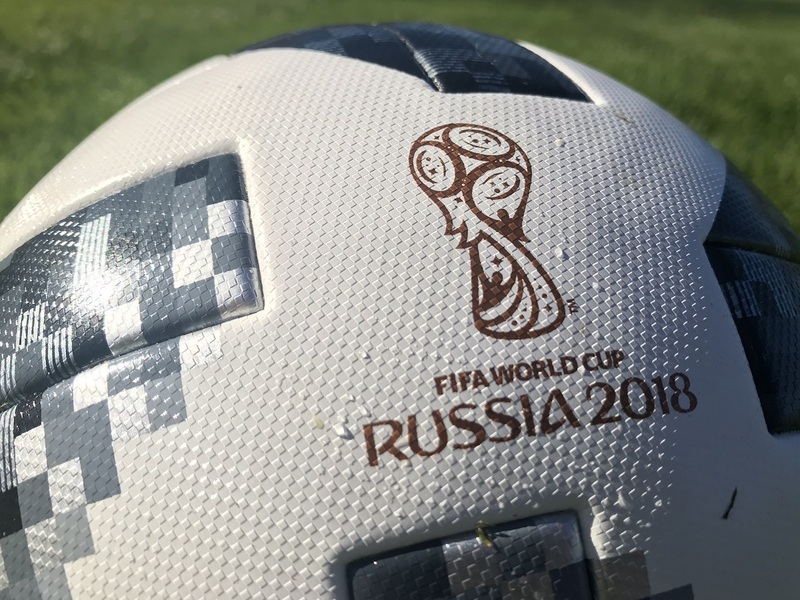 It is the first official match ball to feature an embedded NFC chip, making it the most innovative World Cup ball to date. The chip enables consumers to interact with the ball using a smartphone. Upon interaction, each ball generates a unique identifier, unlocking exclusive content and information for the user. The personalized and location-aware experience displays specific details of each ball and provides access to challenges which users can enter in the run-up to the World Cup. As is the case with top tier adidas balls of late, it is absolutely awesome to play with. There is a perfectly balanced mix of lightweight feel and dynamic ping as you strike it. It easy plays off the foot without creating unnecessary force on the foot. The casing also has a micro texturing that is intended to enhance feel in all weather conditions. Personally, I see the texturing playing its most impactful role in situations where you need to add a little extra spin on shots. For example, free kicks close to goal where the added friction on your foot will naturally increase the amount of bend and swerve. When the Jabulani was released 8 years ago, it was met with widespread criticism for too lightweight on foot. In other words, it almost left the foot too easily, rebounding with a level of spin not natural too a ball. The end result was balls that swerved unpredictably and shots that were a nightmare for keepers. 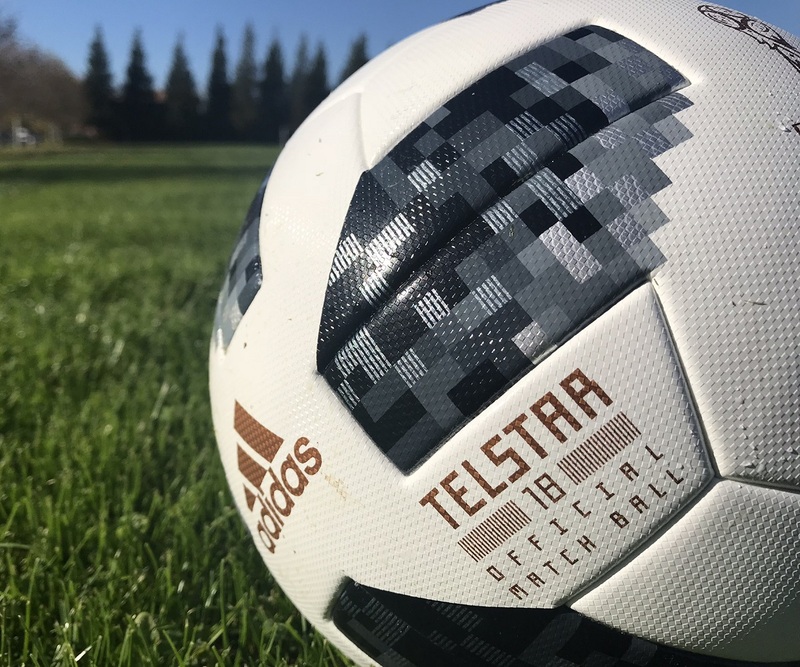 The Telstar18 offers a very natural feel and a realistic flight that will benefit players that strike precise shots without causing unexpected stress to keepers. In other words, it is a very “fair” ball! There are many balls available in the World Cup 2018 line-up, but the most important here is the Official Match version. That clocks in at a pretty hefty $165, along with a wealth of stamped balls to commemorate each individual game that is played during the tournamnet. You can find the entire line-up available at soccer.com.